It has been said before and I will say it again: I love horror movies! I don't know why after all this time it has kept a place as my favourite movie genre. Most of the people I know are scared of them, but I find them exciting and thrilling. It could be the anticipation of trying to survive, the creepy atmosphere (I do love Halloween too, after all) or it could be the concept of the good characters ultimately winning over the evil serial killer. Regardless of the specific reason, I'm a fan and I've seen my fair share of horror movies throughout my life. Scream. A Nightmare on Elm Street. Friday the 13th. Black Christmas. The Cabin in the Woods. These are just a few that come to mind. The genre and tropes have changed throughout the years, but the '80s hold an iconic quality to the horror genre, especially with the slasher movie. They're campy, cheesy, poorly written and yet they're also quite funny! You can't help but laugh a few times as you watch the film. As Scream and Cabin explored, the genre can be turned on their head to become a parody. One of the horror movies I've recently watched is a parody about the '80s slasher movie trope - it is also the movie I will be reviewing today: The Final Girls. The Premise: Set years after the tragic death of her mother, Max (played by Taissa Farmiga) is invited by her friends to attend the anniversary film screening of her mother's iconic B-horror movie, Camp Bloodbath. When a fire erupts in the theatre and the group makes their escape, they wake up in the fictionalized world of Camp Bloodbath where a serial killer is hunting down the movie's cast - including Max's mother (Malin Åkerman) - one-by-one in true '80s movie fashion. The Good: The Final Girls understands what type of movie it is: It's a horror-comedy. As compared to other horror movies which focus on fear and terror, this one is about humour, jokes and being lighthearted. Due to this change of approach, more attention was placed on the relationship between Max and her late mother (her "mother" through the eyes of her Bloodbath character, Nancy) - and I'm glad the movie focused on this. Max had a great relationship with her mother before her death and it was touching to see her reconnect with her loved one again, even if it wasn't really her. The true positive highlight of this movie is that is focused on the relationships and history of these characters instead of mindless gore and murders. The Bad: While the movie did foster the relationships between the characters, it didn't answer many questions regarding its plot. What magic caused them to enter the movie? Did their actions in Camp Bloodbath affect the sequel and the real wold? Are they part of the official movie now? A lot of questions were left at the end and it seemed as viewers we're expected to just be fine with it because... you know, it's a "movie" or something. I don't need everything to be answered, but it would've been nice to tie up some loose ends. 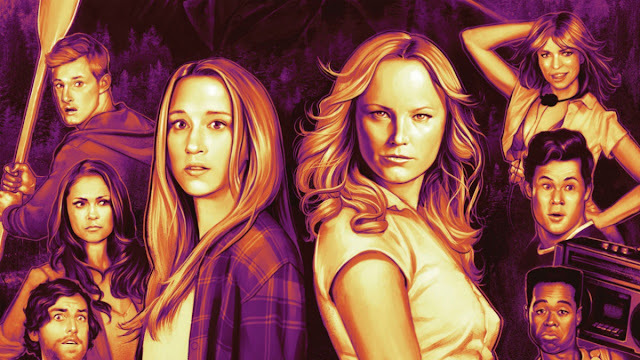 The Final Girls is a cheeky and witty horror-comedy parody that offers more than generic horror. Instead of focusing on blood and guts, the movie highlights the relationships between the characters and the touching relationship between a daughter and her late mother. The jokes are funny and the horror tropes it showcases will bring back nostalgia to any horror movie fan. While I personally loved the movie, the lack of answers and a defined plot could leave some viewers scratching their heads or thinking that this is just another cookie-cutter horror movie. If you're a horror movie fan or like a good comedy, The Final Girls is a good treat for you.